The fourth post in this series is from Angela. 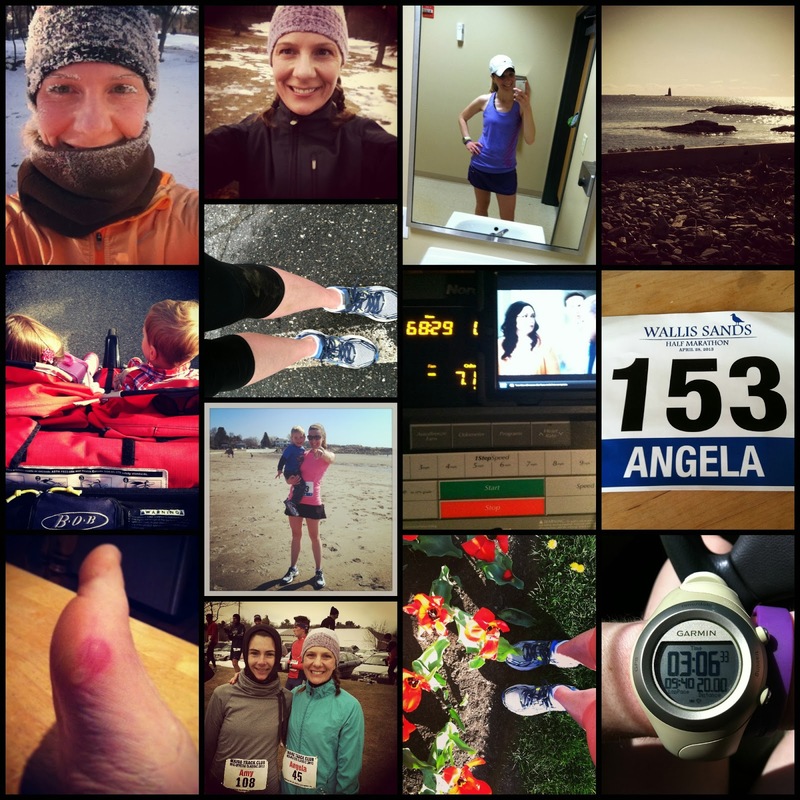 Her story is one that I can relate to considering that my first marathon did not go the way that I had wanted it to. Though her first marathon didn't go how she expected, she has learned from it and is ready to tackle another marathon (rather than being a "one and done" marathoner). I've also dealt with some of the car trouble she experienced (though before a triathlon) on the day of her race! Hey everyone! I’m Angela from Happy Fit Mama. 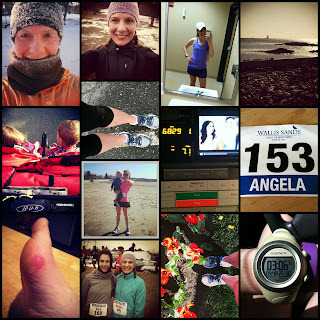 I’m thrilled to share with you my first marathon experience. It was definitely an experience I’ll never forget. Thanks to Jamie for hosting! My first marathon was back in May 2013. The initial reason of why I picked the Vermont City Marathon (VCM) was because my running buddy at the time was going to do it. After getting injured while training for a marathon in 2012, I knew I wanted to do a marathon in 2013 but wasn’t sure which one. When she said she was going for VCM, I thought “Why not?” I’d be running with her anyway and it would be good to have a training partner. Fast forward a couple of months later before training even began, she was injured and not running. I decided to go on with my plans. I was ready to tackle the miles! My training was almost near perfect. I was feeling strong, hitting my paces for mileage, speed work, tempos and just enjoying running despite horrible Winter/Spring weather. With one month to go before race day, I ran a solid half marathon and got a new PR. I also got a huge blister on the inside of my midfoot. That blister sparked a whole slew of injuries that I’m still dealing with now. To compensate, I took it really easy during my last 20 miler and taper in hopes that it would be better race day. VCM is in Burlington, VT – about 4 hours from us. As we were driving the day before the race, rain was coming down in buckets and it was even snowing at one point. Perfect weather for Memorial Day weekend, right? Thankfully the snow stopped but it continued to rain heavily throughout the night and race day. In addition to the weather, I was also dealing with a sick toddler. The night before the race, I barely slept and pretty much talked myself out of having an “A goal” race. I just wanted to have a good run. En route to the race from our hotel, we heard a loud POP that sounded like metal breaking on our car. Turns out it was a suspension coil spring that would need to be fixed before we could drive home. Great! One more thing to think about while running 26.2 miles! The rain was coming down so hard that waiting for the race to start was miserable. Everything was soaked. When it was finally time to start, I jumped into a corral not even paying attention of what the pace was. I just wanted to run to get warmer! The first 14 miles were uneventful. I was running slower than usual but feeling comfortable. The rain was still constant. At one point we ran along a bike path next to Lake Champlain which added lake spray to the mix. Mile 15 brought a HUGE hill that climbed for maybe ½ mile! I had been warned that it was a killer but thankfully there was a large group of drummers at the base who set the tone. It also helped that spectators were packed all the way up the hill on both sides to push you along. There was NO WAY I was going to stop to walk! Things started to slide within a mile after that. My stomach began to do flip flops. I felt nauseous. I made the first of three emergency pit stops off into the woods. I momentarily felt better until it hit me again a few minutes later. With all the stopping and going (literally and physically), my legs were not happy. I started to get severe cramps in my calves, quads and hamstrings - the kind that seize the muscle up into one big knot and throw your gait off. Stretching didn’t help so I resorted to running as much as I could before another cramp would come up. The last 9 miles of the race were a blur. I was in a really bad place. I was thinking of ways to get out of the race. I didn’t even care if I finished. I just wanted to be done. I kept repeating to myself “One and done!” When I saw mile marker 25, I willed myself to run as much as I could, even if it was a shuffle. I could hear the crowds and even begin to see more people. I was going to finish this sucker! As I entered into Waterfront Park, the crowd support lifted me up enough to keep moving through the muddy grass as I crossed the finish line at 4:26. As a volunteer placed the finisher’s medal around my neck, he said “Congratulations! You ARE a marathoner!” He then proceeded to open my chocolate milk for me since my hands couldn’t operate. That’s all it took to open the flood gates of tears. After the race, I was exhausted, angry and disappointed. I had high expectations for myself and I didn’t meet any of them. I couldn’t see past the horrible experience and just be happy that I finished a marathon. After licking my wounds for a couple of days (and finally getting out of Burlington – it’s a long story, you can read it here), I realized I was in no way “One and done.” I know I can do better than that. I know I can I can finish with a smile on my face. I want that more than anything. I’ve begun the search for my second marathon in 2014. I was asked to go back to VCM but I really don’t think I’m ready for that. Too much emotion is tied to that race that I’d be an even bigger bundle of nerves than usual before a race. I’m hoping my next marathon will be different. I want to feel good the whole 26.2 miles and be happy with my accomplishment. Fingers crossed it will happen! Thanks so much for sharing this experience! So much can happen on any given day, and I tried so hard to go in to my first (a couple weeks ago) without big expectations - impossible not to though! And the weather... oy. You didn't give up though, you beat the mental and the distance, and you ran a great time! I'm registered for VCM 2014, so I truly appreciate the warning about the hill! I love this. :) I had terrible weather at my first full and it was ROUGH. You did awesome to stick with it and endure the struggles. That's still a freakin fantastic time too!! Thanks for sharing your story, it's inspiring.